Sabah el kheir LOVEanese! I'm so sorry I haven't been posting recently and I've been on a temporary hiatus (as you can see, my last past was a month ago--yikes! ), I've just been so busy/overwhelmed by my thesis edits. Luckily, it really is almost done this time. So, stay pumped for it, it'll be coming out soon-ish. I also have to admit that--as you can imagine I hope--I've also just been a bit burned out of writing. It takes a lot to write one of my posts, and I've just been needed a break from it all. Also, I must admit something as well. Since I've been in a relationship (read: since she moved to Lebanon), I've already learned so many things that books, articles, academics, and the Internet could never teach me. It's left me a bit overwhelmed as well. I've just realized how little I actually know, and how much you learn about relationships and love simply from you own experiences. Anyways, like I always say: I'm not an expert, and I'm learning just like everyone else. I'm not the teacher, just a student of love and life as well. I hope to be re-inspired though, and as I always say, you should comment and challenge anything I say. Also, don't be afraid to suggest content. 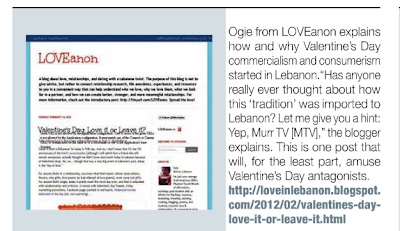 I digress with some quick updates for you, LOVEanon was featured in another magazine recently! 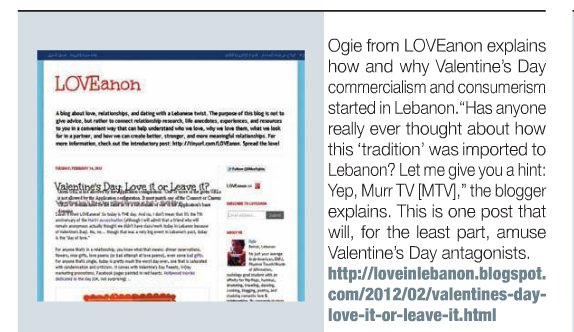 Communicate Levant featured the Valentine's Day post in their new issue. Also, Masculine Magazine featured LOVEanon as well (so now a total of four magazines have covered the blog, these two aforementioned magazines, RagMag, and TaGgED). 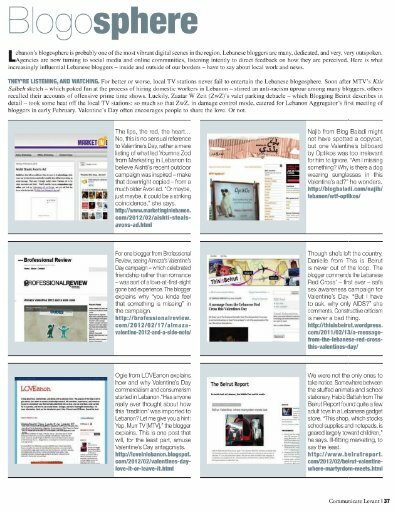 That's not the only blog-related news. Last week, Emma Gatten from the Daily Star interviewed me on a piece she is writing about dating in Lebanon. I talked with her for a long time, and I hope I gave her some useful information (you can read it here). But honestly, there's just not a lot that's really been written about dating in Lebanon. It seems from my research that individuals tend to know a bit about what is normative, but otherwise, it's just a huge guessing game--that is when it comes to many aspects of dating such as what to do, when to do it, and how to meet someone. This is especially true with the last one. Have you ever really thought about where you are meeting people? Where that "special someone" might be hiding, just waiting for you to lock eyes with them? Honestly, for the average Lebanese man or woman, there aren't many options available. I'm going to argue that there are really three ways most meet here in Lebanon: Through family, family friends, in-laws, etc., at uni, or at work. These are the social spaces that are most active in individual's lives: the home, the school/university, and the workplace. The biggest limitation to these spaces, however, is that they don't always have new faces for you to meet, and when they do, it's all about luck if you actually find them attractive. "Chouuu ya helwi! Yalla, come cook and dance for me while I look in the mirror at my hairs." Does this sound familiar? You go to work, see the same people. You go out with your friends, the same friends you've had for years, doing the same thing, at the same place? You go to uni, talk to the same people in the same courses? Or do you not go out on a Friday night because you're too tired and have to work the next day; thus, meeting people is impossible? Or did your parents try to introduce you to someone, but you just don't click? Or you meet someone at a wedding, but they're weird. Or your mom has a friend who knows someone who's eligible, and you meet, but there's just nothing there. Or a friend really want you to meet one of their cousins, but it just doesn't work. Have you ever felt like that? Let's just face it: there really aren't enough space in most people's lives to really meet someone. And I'd say this gets even harder if you're a woman who is in her late 20s or older. Anyone ever wonder why? Think about it like this. I talked about it a bit in this LOVEanon post, but relationships are already conditioned by so much and by so many people/groups in Lebanon that it's really not hard to understand why dating is difficult too. First of all, consider that dating is more or less a newer concept in the country. Perhaps it was ok to date in Beirut in the past, but it is and was a contentious topic--at least for most of the country. Along with the "newness" of dating, there's also the conditions that I mentioned that are required in a partner such as the same social background, same religion/sect, being from a good family (has anyone ever really figured out what that means!? ), and if it's a man, a good job. If it's a woman, well... have a good reputation and produce good, healthy, religious children. Outside of school, work, and family networks, other places that are available for some include cafes, malls, bars/pubs/clubs, and as I mentioned in this post, the Internet. I've heard a lot about how people meet either intentionally or accidentally through Facebook for instance, or through dating sites like OkCupid. To me, this says that there is not enough space for individuals to interact--especially free of the conditions that are often placed on them. Moreover, proximity and sameness are inherently related. I think I've mentioned it before, but if you're Maronite and you live in Bikfaya and you've gone to Catholic school your whole life, and then you go to USJ or NDU and you meet another Maronite, it's normal. Your chances of meeting some different are a lot less than someone who has moved all over Lebanon. We segregate ourselves, and that ultimately affects who we meet, who we love, and who we marry. This post is kind of a deviation from how I usually write, but I just wanted to share the thought with you. I'm really interested in knowing where you meet people, how you date, what the expectations of dating are, and how you meet new people in particular. Please talk about your experience in the comments! And if you do empathize with what I'm saying, there are a few shallow suggestions. The first is go out to a new place. Not the same pub or restaurant or bar. Go to a new place or location, try something new. Even if you're going with your friends, this can be fun and exciting. Alternatively, try grabbing drinks with those individuals who you keep saying you'll go out with but you never "have time to." Make time. Especially if you're feeling the marriage bug and you're looking for someone to no avail. 9/10 times, they aren't going to just fall into your lap. Be proactive! Even though I said a sad reality is that the social spaces for meeting someone are limited, it's not impossible. You just have to work a bit harder. Let me know how you do it, and how it works. There's obviously so many motifs and images in the media and in Hollywood movies showing what dating is, but it doesn't really echo reality, especially the reality here. You are spot on! Recently, I'd been envious of how people around me assimilate into almost homogeneous groups, and wondered if the problem was mine. Recently though, I'm beginning to discover the strength of diversity, especially in terms of dating. I'm currently seeing a girl who comes from a completely different world than me, and its exhilarating! We both seem to have the same basic values, but it feels like there's so much to learn from her. Just hope the connection won't subside after the learning part is over. There's an old platitude that says: "don't get your honey where you get your money". Glad I didn't listen. We met 4 years ago at work (gasp! shock! awe!...at least according to American professional standards) and haven't looked back since. The money now comes from somewhere else for both of us, but the honey's just as sweet :) My point is that no matter how unlikely the who/what/when/where/why of the situation is, be open to the possibility that it just might be the right who/what/when/where/why. Wow! Your response really floored me! I really don't know what to say to that. First of all, I hope that the "suggestions" I offered weren't cliche or simply way too obvious. I feel very humbled now. I'm not sure how to describe it, but I just really sympathize with what you're saying. I hope what I wrote wasn't condescending or disrespectful in any way. You don't sound like a bummer at all. I realize that a lot of women especially feel this way. The question is, what do they do about it? The problem is easy to identify, but harder to address. Where does change need to happen? All levels? Certain ones? Does part of it have to be negotiating our "standards" so that, although we don't necessarily lower them, we just make compromises that make them more realistic. And also prioritize what's really important in a potential partner. Sure it would be great if they had x, y, z, and if they are like a, b, c. But maybe it's prudent to figure out what are the most important features/characteristics/qualities of someone and then go from there. God, I wish I could be a Lebanese match-maker! I think my comment might be more of a response to the newspaper article that you referenced than to your post. It really is true that this dating issue is more of a problem to women than it is for men. Why, may I ask you? Because men are basically given more leeway and respect and opportunity in this country. Why else would the men to women ratio be so much lower than 1? Why else would your good-for-nothing brother be pursuing his studies abroad while you're stuck here in Lebanon, repressing your dreams and desires so that you may finally somehow, any how get a man to marry you before you turn 30 and then cheat on you after you've mothered his children. Men are only pressured to get married so they may father children and produce heirs, and may otherwise do as they like. Women, on the other hand, have much more responsibilities and their upbringing is more repressive. I really like how Emma Gatten ends her article stating that women nowadays expect love to come after marriage. How come nobody's asking women what THEY want, and encouraging them to make up their own minds about what they need to be happy and fulfilled, rather than pressured to followed mindless and outdated traditions that may or may not be their unhappily ever after. So, my point is, don't let this pointless dynamic that's already the source of your man-meeting difficulties entrap and suffocate you. Don't settle for less than what you want, and most importantly, when what you want is really what others want, don't settle at all. I really don't know what to say, just like the person before you, I am really shocked--in a good way--by the poignancy of your response. Second of all, you're right about the double-standard. It's well-known that men have it easier here in some regards, not to say that we don't have our own social pressures to contend with, but still... it's a lot harder on a woman. I completely agree with you though! Empower yourself to want more and go for more than what society tells you is right or correct! I really love your words!